The must-have accessory this season: astaxanthin. Don't let the name fool you--it's not a new program to help you file your taxes, nor is it a diet supplement. It's a super-antioxidant that protects body tissue from oxidative damage. One thousand times more potent than Vitamin E, it's found in salmon and gives the fish their pinkish hue. 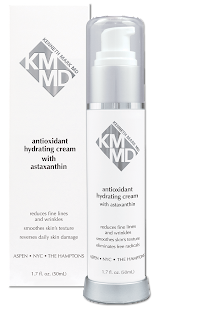 Leading dermatologist and skincare surgeon Dr. Kenneth Mark incorporated astaxanthin--along with seven other dominant antioxidants--in his Antioxidant Hydrating Cream (1.7 fl. oz. ; $95). It promises to reduce melanin production, prevent collagen breakdown, eliminate free radicals, reduce fine lines and wrinkles, even out skin tone, decrease blotchiness, hyperpigmentation and brown spots, soothe irritated skin and add moisture. It's been a week since I've been using it and the first thing I noticed is that my skin feels really soft! Next, the fine lines are finer and my skin's lost that dry, wintery feeling. As an added bonus: The cream works both preventatively AND correctively so you can erase the past and prep your skin for the future at the same time! The only down side--especially in this economy--is really the price. But you know what they say: Dr. Kenneth Mark's Antioxidating Hydrating Cream with Astaxanthin--$95 (available at www.KennethMarkMD.com). Beautiful, youthful-looking skin--priceless! Eye scream, you scream, we all scream for eye cream! But not just any eye cream--you have to check out the latest greatest option from skyn ICELAND. It comes in the company's new Fundamentals Kit, which is designed to soothe irritation, restore moisture and re-balance stressed out skin. 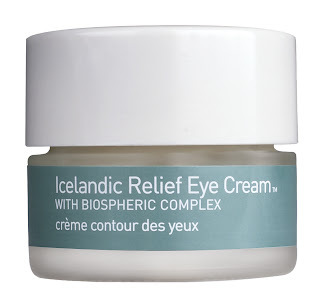 Icelandic Relief Eye Cream with Biospheric Complex ($45) is a lightweight cream that's supposed to reduce puffiness, wrinkles and dark circles thanks to soothing nutrients. And it really works! You can feel an instant cooling effect as you dab it on. Almost miraculously, all evidence of my two kids under three starts to vanish! My skin feels softer and smoother--and the next morning, I even notice a little less stress (think fewer fine--and not so fine--lines!) Also in the kit: A Glacial Facial Wash ($30)--a creamy, foaming cleanser that purifies and smooths without stripping away skin's natural moisture, and the Antidote Quenching Daily Lotion ($45), a lightweight, hydrating tonic that soothes and adds moisture. But the eye cream is still my favorite--my own personal time machine! You can buy any product on its own, or the whole kit for $70 at Sephora stores or www.sephora.com.